Xcode does a horrible job of editing Makefiles (and other extension-less files like dot-files). If you right-click in Xcode on a Makefile and Open with External Editor, OS X opens it in TextEdit. Which is worse. The issue is that TextEdit is associated with extension-less files. Usually to change how files are opened, you select the file in Finder, right-click and choose Get Info from the menu. You then choose the editor in the Open with dropdown and click Change All…. But this does not work for extension-less files, it throws the below error. The solution is to use RCDefaultApp to change this association. Install it now, its free. I’ll wait. 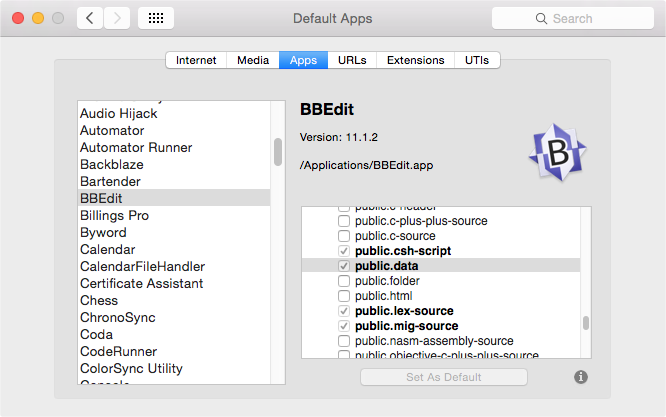 Once its installed, open Default Apps from System Preferences, go to Apps and select the application you prefer for extension-less files, I use trusty BBEdit if course. Scroll down to find the public.data UTI, check it and click Set as Default. 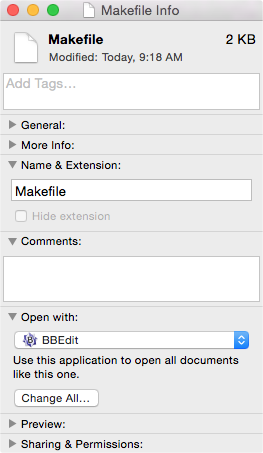 Extension-less files should now open in BBEdit from Finder and from Xcode. I figured out the necessary UTI using the command mdls Makefile and seeing that the system had it as “public.data”. Many other sites say using “public.text” is the correct mapping but that did not work for me on OS X 10.10 Yosemite.